Apple is experimenting with tweaked a Genius Bar service center at one retail store, featuring a larger table removed from the back wall that has replaced the kids' seats and tables. Details and photos of the new design come from Gary Allen of ifoAppleStore.com. 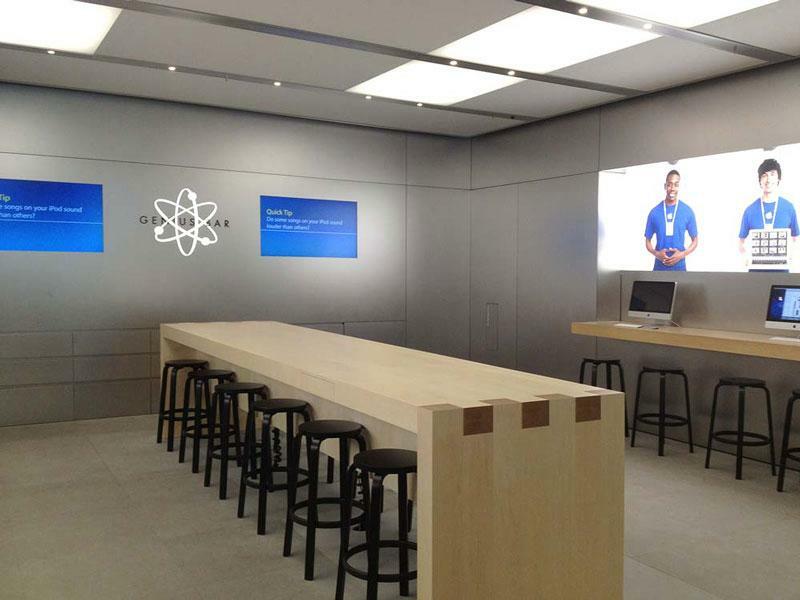 He revealed that the new Genius Bar tables have been rotated 90 degrees so that they are perpendicular to the rear wall of the store, rather than up against the back wall as the Genius Bars have traditionally been positioned. The new Genius Bars will also reportedly emphasize the use of iPads to manage customer service records, giving Apple's touchscreen tablet an even greater presence in the company's retail chain. The placement of the new Genius Bar at one test store takes up more room, and thus replaces the kids' tables that are usually found in the back of Apple's stores. The new Genius Bar is about 15 inches from the rear wall and features at least one currency drawer, with no visible outlets on top of the table. The new table found at one test store packs in 12 total stools, up from 7 stools that were previously found at the 30-foot-wide store. "Apple is in the midst of enlarging or moving several early stores to increase their size to improve the ability to accommodate more visitors," Allen wrote. "However, not every shopping mall or other venue has space available for a larger Apple store. This new 90-degree Genius Bar turn solution would be particularly effective at narrow stores where there is limited room for seated customers." While the new Genius Bar layout is being tested at one specific Apple Retail store, Allen said it's unknown if the design change will eventually make its way to Apple's other retail locations.